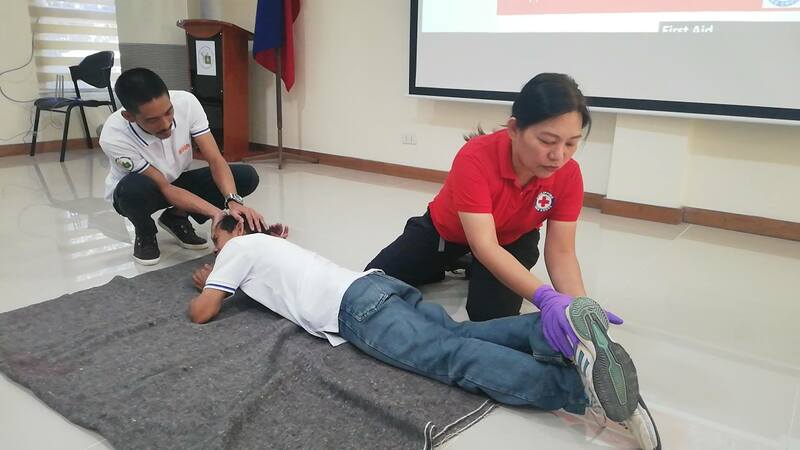 Ms. Marie Imperial of Philippine Red Cross - Cavite Chapter demonstrates proper first aid during the Training on Disaster Risk and Reduction Management (DRRM). partnership with the Philippine Red Cross – Cavite Chapter conducted the second phase of Training on DRRM on November 5 - 6, 2018 at ATI CaLaBaRZon training hall in this city. Thirty-two staff of ATI CaLaBaRZon participated in the training. On the two-day training, staff learned the different disaster risk management strategies, identified hazards in the workplace and performed various first-aid and basic life support procedures. Marites P. Cosico, Center Director of ATI CaLaBaRZon expressed her support highlighting that the acquired knowledge and skills are big aids not only to themselves but most especially when conducting trainings on field. They can also share the learning to their locality. The training aims to further improve the center’s disaster response management and to equip the ATI CaLaBaRZon employees with the necessary knowledge, skills and orientation regarding DRRM. The first phase of training on DRRM: Seminar on Fire Safety was held on April 18, 2018.